Then one night, her eyes meet with those of another 50-something divorcee. His name is Arnold, and he too has two adult children. But Arnold, played by the forever underrated John Turturro, has been divorced for only a year. And his daughters have a peculiar situation, in that they still live with their mother. And as Gloria and Arnold deepen their relationship, Arnold never tells his daughters he’s falling in love with another woman. These is the stuff of one of the best films to hit the screen so far in 2019. Lelio – the Chilean director responsible for 2017’s Spanish-language film “A Fantastic Woman” (starring Daniela Vega) – mines every last ounce of energy and effort out of Julianne Moore, one of our greatest living actresses. 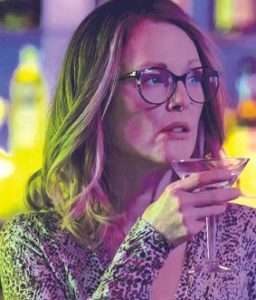 Not that I would expect anything less, but “Gloria Bell” marks another career achievement for Moore. And John Turturro disappears into his meatiest role in years. It’s the type of sad-sack character Woody Allen would parody; Turturro plays it straight, and nails it. We’re never quite certain what secrets Arnold is withholding from Gloria; whereas we know she’s placed all her cards on the table face-up. 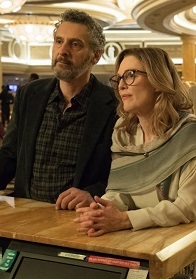 My one big complaint with “Gloria Bell” is the music. At first, it’s fun to see Moore sing along with ‘70s and ‘80s songs in her car and in her apartment. But eventually we realize the music has been selected to match Gloria’s feelings of the moment. After a good date with Arnold, she sings along to Paul McCartney’s “No More Lonely Nights.” After a particularly stressful evening with him, she listens to her musically-inclined children perform an impromptu send-up of Gilbert O’Sullivan’s “Alone Again Naturally.” A little of this matching of song and situation goes a long way.